From Gandhi's salt march to the US civil rights movement and Occupy Wall Street, nonviolent campaigns to promote democracy, human rights and social justice have long played an important transformative role in local, national and global politics. Some have succeeded, some have failed; but nonviolent action remains a very effective means of achieving significant social and political change. 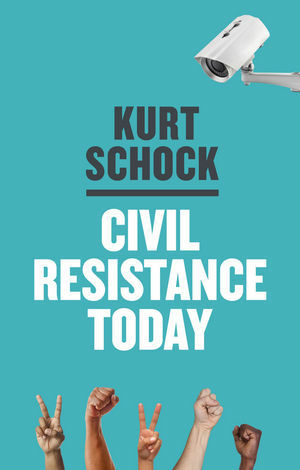 In this authoritative book Kurt Schock expertly guides readers through the changing terrain of nonviolent struggle, exploring the historical roots and development of modern civil resistance and its proliferation in recent decades. Discussing movements against economic and social injustice as well as political oppression, he explains how resistance happens and unpacks the complex interactions between state and non-state actors that affect the trajectories and outcomes of nonviolent campaigns. Drawing on a wealth of empirical data and comparative research, Civil Resistance Today will be an essential "one stop shop" for anyone keen to learn more about the methods, objectives and outcomes of civil resistance in the contemporary world. Kurt Schock is Associate Professor of Sociology and Global Affairs at Rutgers University. Civil Resistance Today provides the most comprehensive overview available of the issues and approaches in the burgeoning field of strategic nonviolent action. Ideal for classroom use and for anyone who wants to better understand the history and dynamics of this growing phenomenon of popular mass mobilizations for social justice and political freedom.